A nearly 1,000 foot spider web has made its home in the village of Aitoliko, Greece, causing much media attention. But is the web really a cause for concern? 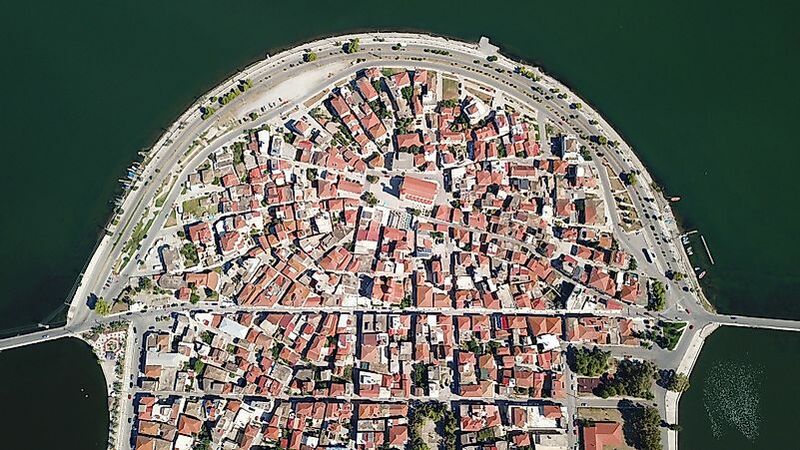 An aerial view of Aitoliko, Greece, pre-spider web. Photo credit: Shutterstock.com. A stretch of about 984 feet of spider web has blanketed land along the shores of Aitoliko, a town in western Greece. The massive blanket has been created by Tetragnatha spiders, a species known for constructing large mating nests. The nest, though alarming, is not the first of its kind to occur in the area – a similar large web was last seen in 2003.
humidity and high temperatures, both of which are in no short supply in the coastal city of Aitoliko. Fortunately, experts have been able to ascertain that the spiders and the web do not pose any risk to human life. In addition, they will not cause any sort of damage to the animal and plant life of the ecosystem. The web is expected to disintegrate naturally over time.